Demonstrators call for the resignation of Egyptian President Hosni Mubarak outside the Egyptian Embassy in London on Saturday. (CNN) -- Egyptians and activists around the world took to the streets in various cities Saturday to show their support for the protests currently underway in Egypt and to join the call for President Hosni Mubarak to step down. 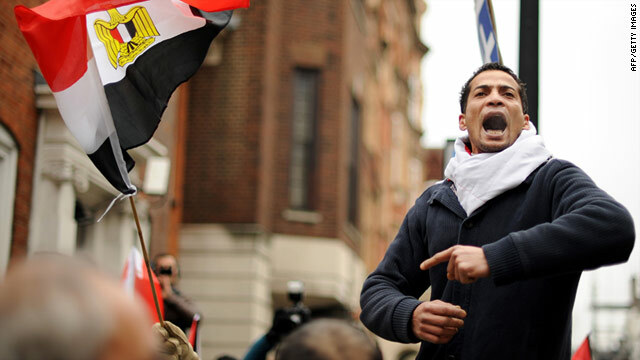 Outside the Egyptian Embassy in London, people rallied, chanted, hoisted banners and demanded change. One sign, written in red ink, read: "From The Nile, To the Sea -- Egypt Soon Will Be Free! Freedom for Egypt!" "People were clearly voicing their anger at President Mubarak's regime but similarly they were also very passionate about their demands for democracy and political reforms," said Amedeo d'Amore, who attended the London protest. Demonstrators chanted: "One, two, three, four, we don't want Mubarak anymore!" d'Amore said in an e-mail to CNN. Elsewhere in Europe, protesters in Geneva shouted slogans in Arabic, French and English, chanting, "Get out, Mubarak!" according to Courtney Radsch, who attended the demonstration there. Radsch sent CNN a video of the protest that showed a crowd of people carrying signs that read, "Freedom. Social Justice. Democracy" and "Free Egypt." Protests also took place in cities throughout Canada. About 150 protesters gathered outside the Egyptian consulate in Montreal, CNN affiliate CTV reported. In Toronto, a downtown rally drew more than 500 people, it said. Ahmed Khalifa, who helped organize the Toronto protest, said he was encouraged by the protests in Egypt and stressed their significance. "We are witnessing a great change in history," he told CTV. "It's like the fall of the Berlin Wall. We are watching Egyptian people and Middle Eastern people telling us that 'we want freedom.' 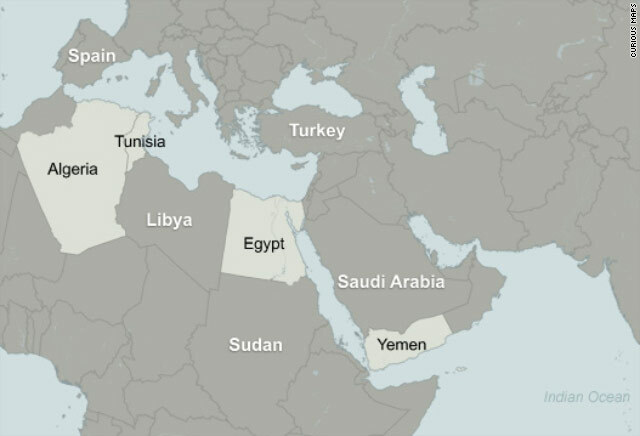 "
Anti-Mubarak demonstrations were also held across the United States.